Earlier this week, Canalys announced that 34% of smartphones shipped in Q1 2014 had a screen size larger than 5 inches. While a hard screen size cut-off is too restrictive a definition, the data does show that "phablets" are now mainstream. Our challenge now is to gauge the impact of phablets on tablet usage. The chart above shows the percentage of all mobile browsing sessions that can be attributed to tablets. 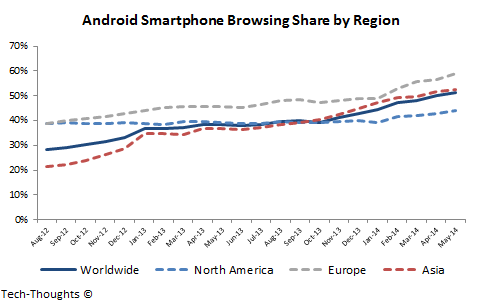 70-95% of all mobile browsing (depending on region) happens on the Android or iOS platforms. Therefore, we can safely say that smartphones account for the vast majority of mobile browsing outside of tablets. This data shows that the share of browsing from tablets peaked in early 2013 and has declined by about one-fifth since then. 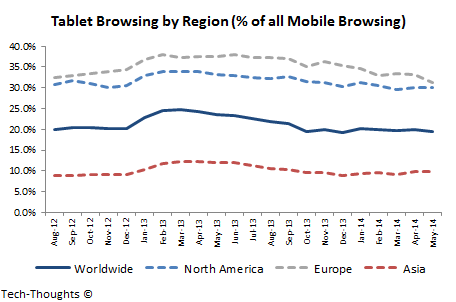 Interestingly, Europe saw the largest decline in tablet browsing among all regions. Statcounter's data clearly shows that this decline was caused by the increase in browsing sessions from Android smartphones. But was this decline driven by the growth in smartphone volumes or increase in screen sizes? This is even more difficult to answer.